Writing an effective and engaging About Us page involves finding the right balance between following digital marketing best practices while avoiding the formulaic. A good About Us page should establish your authority, outline your experience, and tell your company’s story in a way that showcases the brand’s unique personality, voice, and style. Learning how to make an About Us page for a website is not as easy as you might think. Here are a few tips and examples to help you get started creating a professional About Us page for your company. From SEO keywords for About Us pages to your unique selling proposition, writing an optimized About Us page is about painting a picture for your current and prospective clients. Demonstrate what you can do, prove that you can deliver, and add a little flair to illustrate how you stand out from the competition. Who are you? What do you believe? What are your goals and what do you bring to the table as a company and brand? There is no greater truism in web design and content marketing than this: the information on your website’s About Us page is only as good as the layout and formatting. Breaking up long blocks of text into shorter, succinct paragraphs and using subheadings and bullets throughout will make the content on your page stand out and much easier to digest. Learning how to write an About Us page in a visually appealing way can really help position your brand in a positive light. If you have great testimonials from current and former clients, consider using the best ones in pull quotes to really emphasize your experience and best success stories. Also keep in mind that while content may be king, visuals go a long way in telling a story and keeping the reader interested. Professional and well-designed images like photographs and infographics are essential to making your About Us page really pop. When it comes to SEO, About Us pages can be leveraged a few different ways. If your unique value proposition is closely tied to a keyword group, you can use SEO keywords for About Us pages that reflect that value propostion. For example, if you offer consulting services that leverage lean six sigma, your homepage might be focused on “consulting services,” or a more local SEO marketing approach, like “consulting firms in [city].” Writing a good About Us page for that same company might include keywords revolving around “lean six sigma” or “six sigma manufacturing.” Because lean six sigma is what sets your consulting firm apart from the rest, you can use those unique keywords for your About page. In most cases, your unique value proposition won’t be tied to a strong keyword group like our example above. If your homepage is about digital marketing, you don’t necessarily want to optimize your homepage for the same terms. Doing so could cause keyword cannibalization, and negatively impact the rankings of your homepage. Typically, SEO for About Us pages won’t be a priority, but make sure you don’t noindex/nofollow the page. Your About page has the potential to pick up a lot of backlinks, so nofollowing it would be detrimental to your link building strategy. About Pages also typically show up as sitelinks for your brand searches, so noindexing it would force Google to replace that real estate with another page that doesn’t communicate your brand as thoroughly. The last, and perhaps most important About Us page SEO tip is related to structured data. Schema markup is a form of structured data that you can include on your website to help search engines better understand your content. There are different schema types that you can use across your site. For example, there is a schema type called LocalBusiness that lets you identify details about a local business location with special code. When it comes to schema for your About Us page, you will want to use SiteNavigationElement markup. This will help your about page show up in the sitelinks when someone searches for your brand. You can find an example of MARION’s About Us page being marked up with SiteNavigationElement schema below. The best way to get started is by drawing a little inspiration from websites that have mastered the About Us page writing game. You want your own page to be unique and one of a kind, but studying what makes good About Us pages work can help you pick up useful tips about what works when you are putting together your own strategy. Here are a few examples of About Us pages that hit all the right notes. 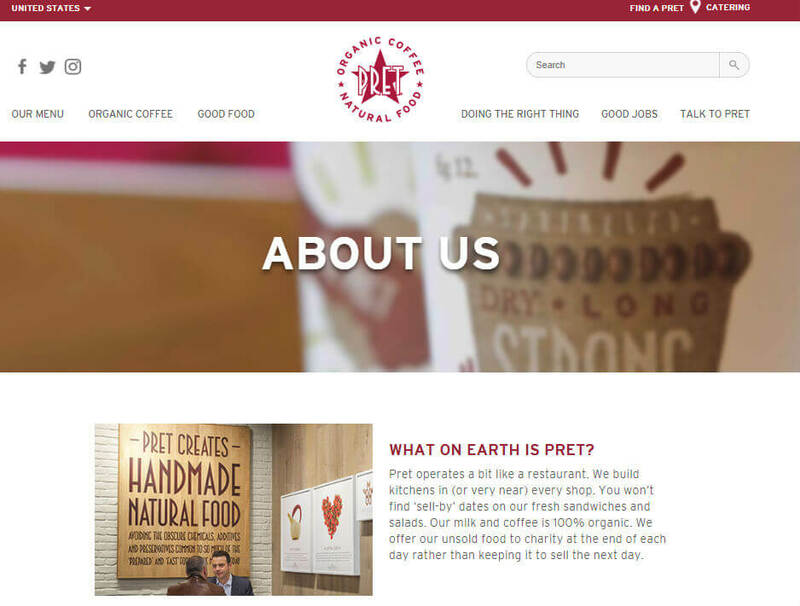 Pret gets things going by asking (and answering) a question that may very well be on an unfamiliar consumer’s mind “What on earth is Pret?” They follow it up by explaining how they are more than just another coffee and sandwich chain. It’s short, to the point, and uses a well balanced mix of text and visuals. 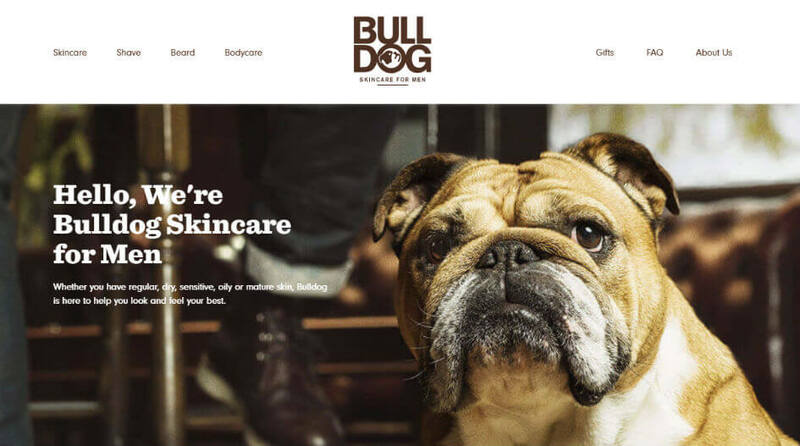 Whether your company is named after a dog or not, who can resist an adorable picture Man’s Best Friend – which is exactly what Bulldog skincare banks on with the image on their About page. They create a brand name by using a reinforcing image that sets the tone for their mission statement – to provide men with all natural skin care products. Does Nike even need an About Us page one might wonder? Rather than resting on the reach and name recognition of the ubiquitous “just do it” slogan, Nike’s About page uses an image and text elevating regular people to athlete status to illustrate that their products are made for anyone on the move. Rather than using an image of professional athletes, Nike’s About page becomes instantly relatable and creates a connection with the average consumer by allowing them to literally picture themselves in the shoes. If you want your customers and prospects to know who you are, the easiest way is to literally show them. The Eight Hour Day team uses images of their workspace, complete with adorable office dog, to straightforward descriptions of their creative process and sources of inspiration. Don’t leave your digital marketing results up to chance. Engage with a creative marketing agency like MARION, and start elevating your brand today! 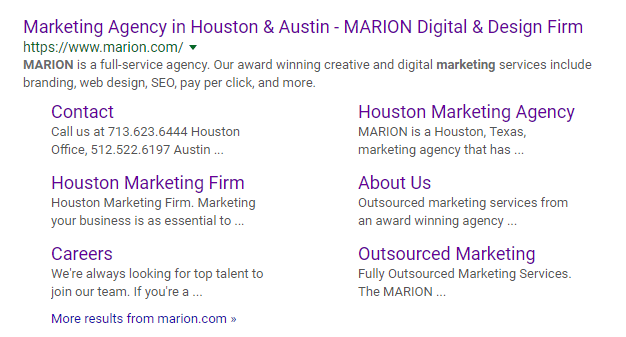 For more information on how our marketing firm can help grow your bottom line, contact Marion today.